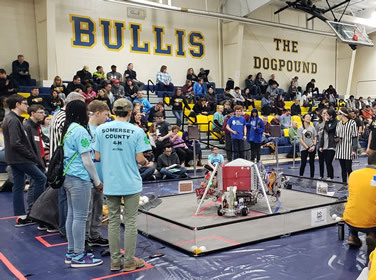 On January 19th & 20th, the Bullis Robotics teams #7540 and #9667 partnered with Rockville team #9794 Wizards.exe to host an inspiring two-day tournament at the Bullis Athletic Center. Attending the tournament were 54 teams representing public and independent schools as well as enrichment programs from Maryland, DC and Virginia. Teams were judged on their engineering process and outreach and competed in matches throughout the day to attempt to qualify for the Maryland FTC Championship to be held at University of Maryland-Baltimore County on February 3rd. Please congratulate Lauren, Everett and the members of the Bullis robotics team for all of their hard work both leading up to and at the events. Our two Bullis teams helped run the event on Saturday and returned on Sunday to compete with their robots. I have received many compliments from attendees praising the students for their positive attitude and work ethic. Under Lauren Rathmann and Everett Lum's leadership, the Bullis robotics team continues to grow and improve with each tournament. They will launch right into preparations for their next qualifier on February 17th at Oakland Mills High School in Columbia. Finally, a big thank you to all those Bullis staff members and families who volunteered at Saturday's tournament – it is an all-day time commitment with few breaks but the Bullis volunteers were full of energy and enthusiasm throughout the day. We could not have done it without the help of the Facilities team, who even remained in the late hours of Friday night to ensure that we were ready to go on Saturday morning and were on-call throughout the weekend to ensure that the event ran smoothly; as well as Security, who managed robot arrivals and departures and stepped in when they saw a task to be done and the Athletics Department who goes out of their way to support use of the Athletic Center during the weekend. We are fortunate to be able to host such a great event on our campus – I invite you all to attend or volunteer next year!